The Lewis & Clark Montessori Primary Program includes two traditional Montessori ‘Children’s House’ classrooms of 3 to 6 year olds, as well as a non-traditional ‘Kindergarten’ classroom of 5 and 6 year olds. In the Primary classroom, children are exposed to a wide variety of experiences in a safe, prepared environment, allowing exploration of the world through materials that give the them the keys to real-world experiences. Enrollment in the charter school as a 5-6 year-old is a state funded full day program for all students. Enrollment is by lottery. It is important to note that enrollment in the Children’s House does not guarantee admission to the Kindergarten or elementary, with the exception of siblings of currently enrolled students. Children may matriculate into the program throughout the fall. Enrollment will be open all year for incoming 3, 4 and 5 year olds. Why is it called a Children's House? The term comes from the very first program founded by Dr. Maria Montessori in Rome, Italy in 1907, which she called the Casa dei Bambini, or Children’s House. This is where Dr. Montessori began her work creating an educational system to serve a child’s developmental needs. The term connotes a place for children to explore and learn naturally, and now applies to those programs serving children ages three to six years. The norm in the Montessori Method is for classrooms to be structured with a three-year age span. This allows children to remain with the same class/teacher/peer group for a full three years. Much peer learning takes place between and within the age groups, and children are allowed to progress at their own rate. This program provides a high-quality early childhood Montessori education. It also gives children entering the Elementary program more than one year’s experience in a Montessori environment, laying the foundation for deep exploration and discovery throughout their time at Lewis & Clark Montessori. Monthly tuition must be paid by electronic debit from your checking account by signing our Direct Payment Authorization Form. Half day tuition is $5,255, paid in 10 payments of $525.50/month. Full day tuition is $8,420 with 10 payments of $842/month. The annual resource fee of $250.00 will be waived with payment in full at school start. Tuition is prorated for children who begin after the first day of school. Half Day: 8:15 – 12:15, Monday through Friday. Full Day: 8:15 – 3:30 PM Monday through Thursday, 8:15 – 1:15 Friday – early release day. The program is five days per week. Enrollment is open to all children ages 3-5, without discrimination to ethnicity, religion, socio-economic status, or any other social, cultural or economic division. Enrollment is open until filled, whereupon a wait list will be maintained. Priority may be given to siblings of students currently enrolled in Lewis & Clark Montessori. Other decisions about student acceptance may be made by the Executive Director to maintain the gender and age balance important to a thriving Children’s House program. There is a non-refundable deposit of $250.00 due upon acceptance, which will be credited toward the first month’s tuition. Parents must sign a tuition contract agreement to enroll their child. Returning students start the first day of the school year in September. Individual and group work time for all students. The children are given lessons with materials on the shelves, in social relations, and in movement. The work encompasses all “curriculum” areas, including preparation for mathematical concepts, preparation for reading and writing, natural and physical science, geography, music, art, social development, and movement. There is a flow from indoor and outdoor environments. Snack is offered during the morning. Nap period for children who nap. Afternoon work period continues for other children. The program is overseen and administrated by Melissa Harbert, Executive Director. Parent and Teacher Conferences are scheduled for November and March, dates to be announced. Although they may be held at other times as requested by the teacher and/or parents. Like all Montessori programs, parents are encouraged to observe their child and the classroom at work. However, respect is given to the classroom for settling in before admitting guests to observe. Typically we allow at least 6 weeks for this process after the last children have begun. Classroom observations of the Children’s House may begin mid-October. Families enrolled in the Children’s House will be provided with all Lewis & Clark Montessori news communications, and will also be welcomed and encouraged to attend parent education nights and other events hosted by the school. The Children’s House is a fee-based private program affiliated with Lewis & Clark Montessori Charter School, and will follow the same school calendar. All families will be given a school calendar, and events are advertised in the weekly news, on the school’s Facebook page, and via the online calendar. The Primary curriculum centers around beautifully made materials that are designed to give sensorial impressions of qualities and experiences. The adult introduces the child to the material, and then steps back and allows for greater exploration with a minimum of guidance. Through this curriculum, the student is exposed to a wealth of impressions and information, as well as building basic skills. Exploring the natural and cultural worlds, sensorial impressions, and social relationships early in life allows students the opportunity to become self-motivated, independent learners with an active interest in learning that will continue throughout life. The child in the first plane of development (0-6 years old) has unique characteristics which naturally predispose her to an exceptional ability to learn. Dr. Montessori called this the “absorbent mind”, referring to the young child’s ability to take in impressions and experiences in their entirety, likening the mind of the young child to a sponge soaking up eagerly whatever comes its way. Recent research has borne out Dr. Montessori’s theory that the human personality is formed largely by the experiences gained in the first six years of life. Though people continue to grow, change, and learn throughout life, the basics of the personality are formed by early childhood experiences. This age of child has an irrepressible thirst for experiences. There are rapid changes occurring in the body and mind of the child, which tends to increase their sensitivity to the environment. Firmly rooted in the present, the tangible, and facts, the young child has difficulty projecting forward or backward in time, imagining information that is not concrete, and separating fiction from reality. The children work toward functional independence, gaining positive social relations, and for refining their fine and gross motor skills. The materials and classroom environment are constructed so that the young child can satisfy the needs for development during this important formative period. Young children delight in the exercises of Practical Life, which allow the child to refine movement, follow a logical sequence, and develop concentration and independence. The exercises themselves incorporate the skills of daily living: care of the self (dressing, buttoning, tying, grooming, etc. ), care of the environment (table washing, dusting, polishing, sewing, etc. ), and care of others. Students are given the freedom to repeat the exercises and master the hand-eye coordination involved, while satisfying their deep urge for useful work. These materials encourage the children to discover and experiment with the senses – sight, sound, taste, touch and smell. Actively using sequenced materials allows the child to use all five senses while learning. Through the work with the materials, a child gains the ability to interpret, organize, and classify her impressions. Building on these first experiences, the she develops more conceptual understanding of ways to explore the world, laying her foundation for abstract learning. Children progress naturally through the exploration of spoken and written language, first with the sounds in a word, then the symbols of letter shapes, to writing phonetically, and finally to an “explosion” into reading and writing. At a young age, students gain an appreciation for the use of language and skills to convey their thoughts to others. Reading skills develop further with the experience of stories and poetry. Satisfying tactile materials allow the child to enjoy the study of grammar through symbol and object games. 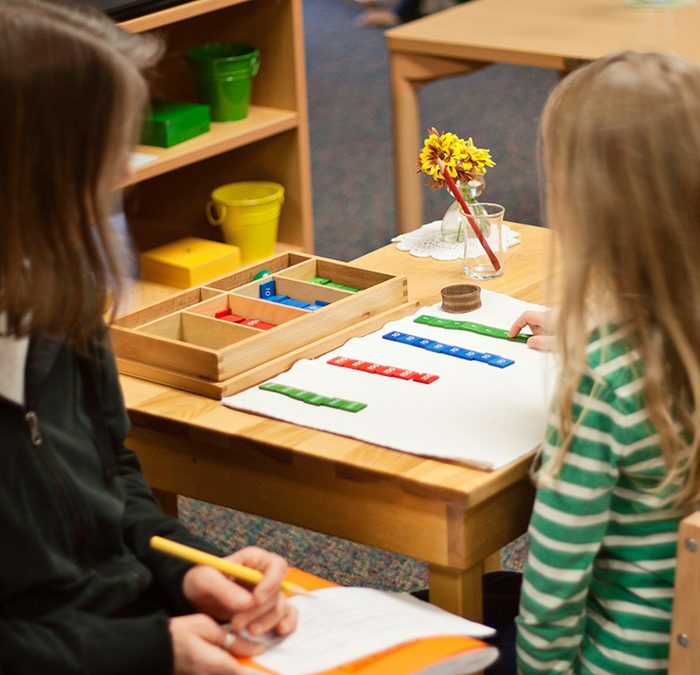 Montessori’s experiential, activity-based approach, uses concrete manipulative materials to lay the groundwork for number sequencing, the decimal system, and basic arithmetic operations. With the materials, the children have a sensory exploration of beginning algebra and geometry. The concrete introduction leads the child through a gradually more abstract process, developing reasoning and problem solving capabilities. An array of beautifully-crafted materials lead the children on an exploration of the continents and countries of the world, along with the cultures and needs of the people of the planet. The world’s flora and fauna are introduced through a study of botany, zoology and the biomes of the world, and children also explore the basic concepts of physics. A variety of artistic media are introduced to the classroom so students can explore their possibilities, thus producing true creative expression. The children work with the diatonic and chromatic scales in music, and are exposed to many styles and uses of instruments through music appreciation and hands-on group lessons. The classes sing, move to music, and act out dramatic stories.